All new ALOGIC Carbon Series offers exceptional performance for all HDMI applications. 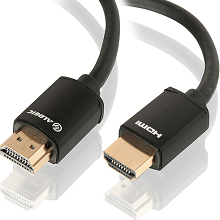 The custom designed cable provides carbon fibre like fit and finish on a HDMI cable. The die cast connectors sport a seamless design for perfect fit on the HDMI receptacles making the cable robust and elegant at the same time.CARBON SERIES has been designed keeping in mind requirements of installers and home user alike. Cable features an ultra flexible design which make it easy to install and use in places with tight spaces and angles. The cable meets and exceeds the latest HDMI 2.0 specifications making it full proof for all your current and future devices. It offers full support for 4K x 2K video 3D Video HDMI Ethernet Channel ARC Refresh rates up to 120 Hz Dolby TrueHD and DTSHD Master Audio Maximum Bandwidth up to 18Gbps Superb build quality and perhaps best of all the ALOGIC Life Time Guarantee for your peace of mind.